You guys know by the recipes I tend to post here that I like to create meals that are quick and easy. I think one of the reasons I disliked cooking for so long was due to the time involved in making elaborate dishes from scratch. It took me a while to realize that it is indeed possible to prepare meals for myself and my family that can accommodate a busy lifestyle by saving time, but are still nutritious and delicious. I've found that the key to doing this is, like most things in life, balance. A balanced plate that contains, for example, one frozen item (frozen prepared foods are a great time saver and there are so many new dishes and flavors to choose from!) alongside a unique salad or homemade veggie dish, makes for the perfect meal. 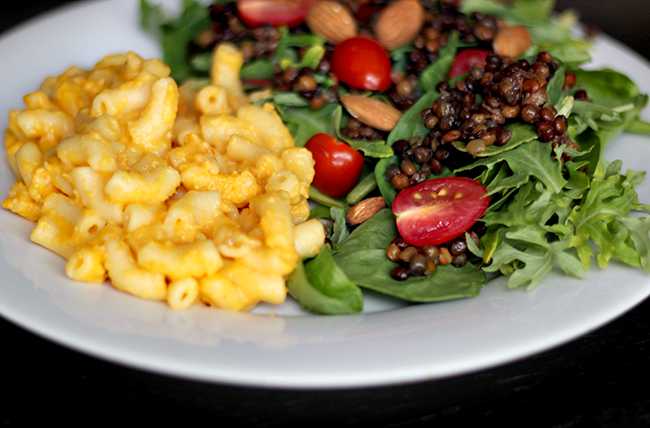 And today I'm sharing with you my current favorite - lentil and spring green salad with baked macaroni and cheese. 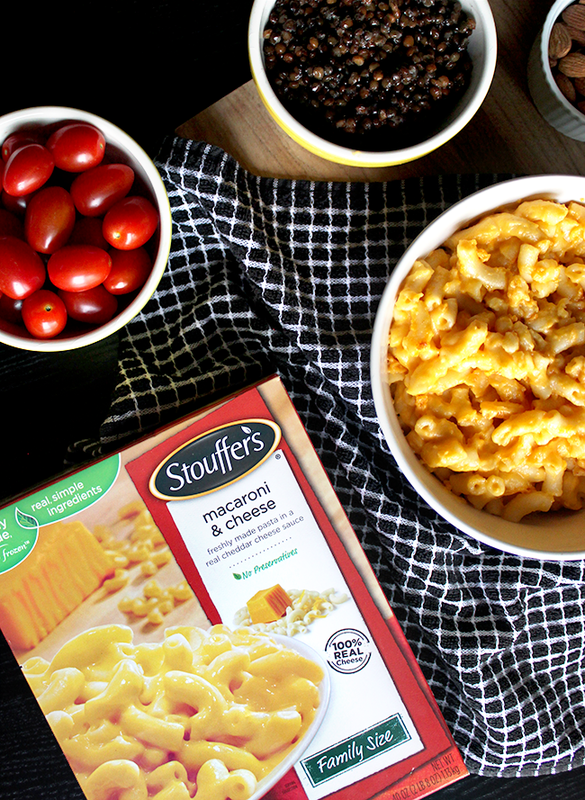 Prepare the Stouffer's Family Size Macaroni & Cheese according to package directions (either in the oven or microwave). For the salad, put spring greens into a large salad bowl. Slice tomatoes in half, and add to bowl, along with lentils (I buy them pre-steamed) and almonds. Toss. For dressing, whisk together the olive oil and mustard, then cut lemon in half, squeeze in juice, and whisk again. 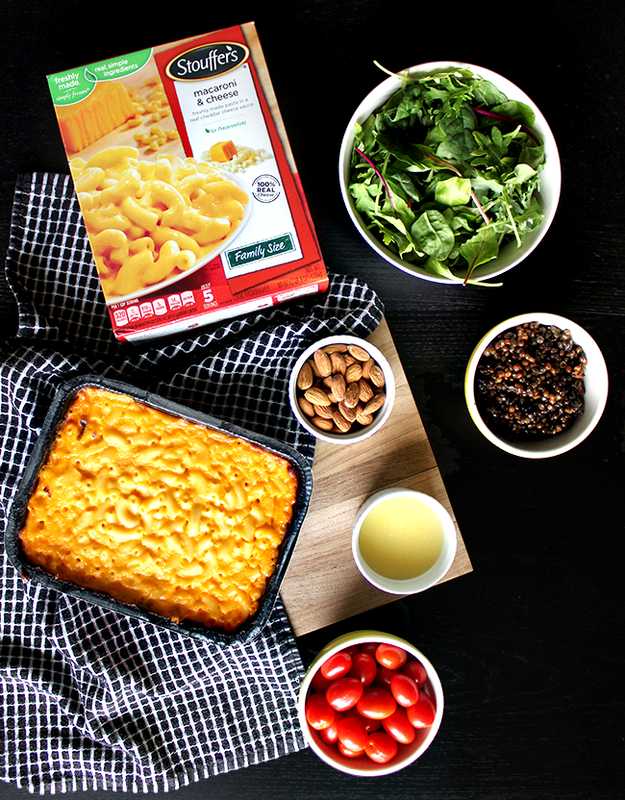 Pour dressing over salad and serve alongside the mac and cheese. Everyone in this house is a big fan of this meal. 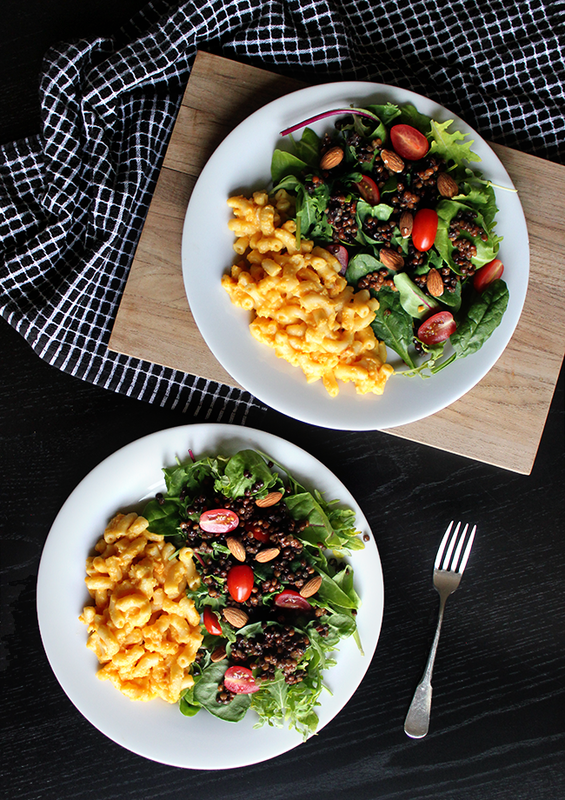 The lentil and spring green salad perfectly balances out the rich flavor of the macaroni and cheese, and it ends up being a hearty, delicious dinner or lunch that is incredibly simple to put together - which for working parents of a three year old and a one year old is a lifesaver. And I love how the Stouffer's Mac & Cheese recipe includes real, simple ingredients, like freshly made pasta, cheddar cheese, milk and butter. We know that everyone wants to eat better but needs inspiration and simple solutions to choose from so they can make it a reality more often. This dish is just one of endless possible combinations that work within the concept of balancing your plate. To build a balanced meal, use frozen prepared foods as your base and pair with an easy-to-make side dish made of fruits, vegetables, whole grains and/or low-fat dairy. 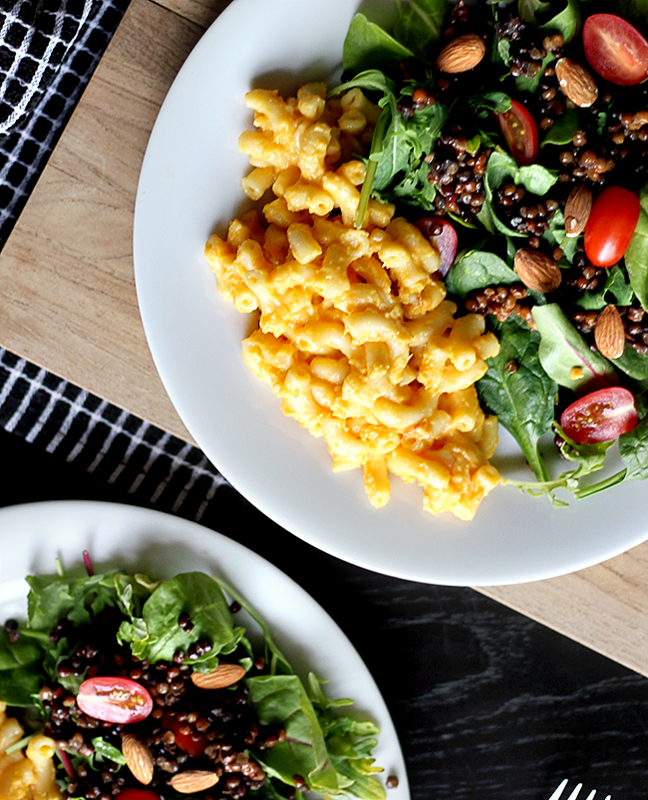 It's a great way to enjoy a nutritious, tasty meal without the effort of making an entire dinner from scratch. 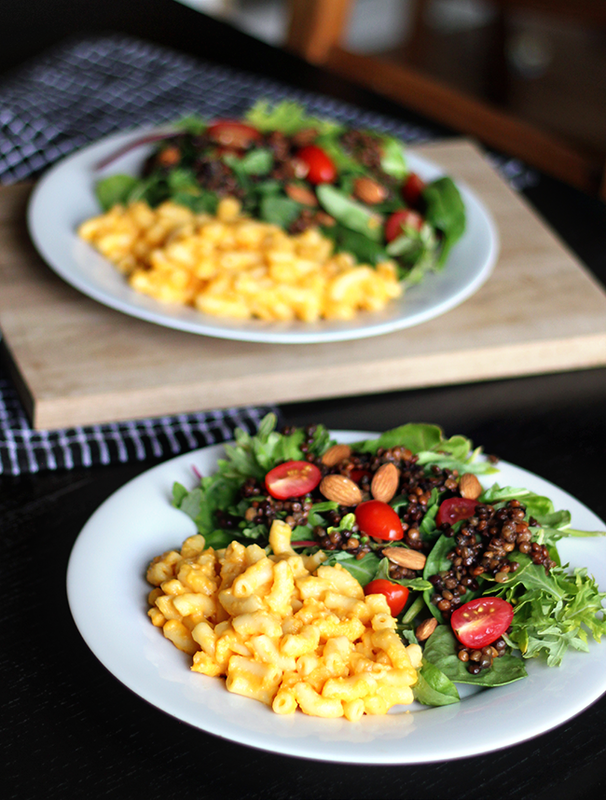 If you try these recipes for your balanced plate, I'd love to hear what you think! And if you want to see this meal being prepared, stop by my Instagram and check out the short video I put together the last time we made it. This looks amazing and I agree balance is the best idea when cooking! Yum! I am making this for sure. Looks delish.